The Mixed Waste Landfill (MWL) is an unlined dump, home to “low level” radioactive waste including byproducts of nuclear weapons, nuclear energy production, metallic sodium as well as many other hazardous materials. The Mixed Waste Landfill (MWL) is an unlined dump, home to “low level” radioactive waste including byproducts of nuclear weapons, nuclear energy production, metallic sodium as well as many other hazardous materials. This unlined pit has the potential to leak into local aquifers and there is evidence that contamination could already be occurring. Radiation is something that is hard to visualize, thus the focus of our project was to create a map to visually map out the potential dangers of the Mixed Waste Landfill. 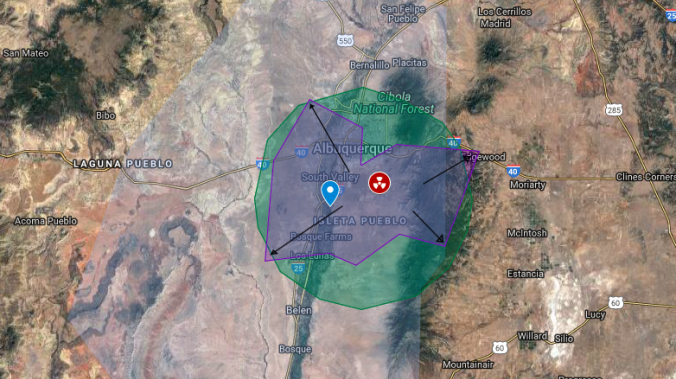 The map indicates the location of our precious aquifer, the proximity of residencies to the MWL, and the potential area of impact if the dump were to explode (based on a documented explosion of a similar dump in Beatty, Nevada).